There are lots of Arduinos and Raspberry Pis for students to use. You are welcome to check one out. 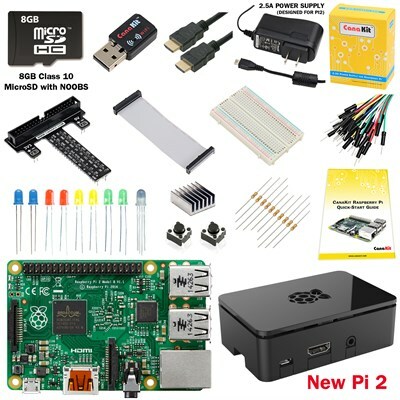 Below is some of the Arduino & Raspberry Pi hardware that is available in Room 222. SparkFun Inventor’s Kit – V3.2 The SparkFun Inventor’s Kit (SIK) is a great way to get started with programming and hardware interaction with the Arduino programming language. SparkFun Mini Inventor’s Kit for Redboard The SparkFun Mini Inventor’s Kit (SMIK) is a great way to get started with programming and hardware interaction with the Arduino programming language. Intel® Galileo Gen 2 The Intel® Galileo Gen 2 board is based on the Intel® Quark SoC X1000, a 32-bit Intel Pentium®-class system on a chip (SoC). It is the first board based on Intel® architecture designed to be hardware and software pin-compatible with shields designed for the Arduino Uno R3. The Galileo board is also software-compatible with the Arduino Software Development Environment, which makes getting started a snap. SparkFun RFID Starter Kit This it the SparkFun RFID Starter Kit, an all-in-one kit that offer everything you need to get your next RFID project off the ground. SparkFun XBee Wireless Kit This is the SparkFun XBee Wireless Kit, the perfect box full of goodies to get you started using XBees. SparkFun Weather ShieldThe Weather Shield is an easy to use Arduino shield that grants you access to barometric pressure, relative humidity, luminosity and temperature. SparkFun WiFi Shield – CC3000 This is a shield for the CC3000 WiFi Module. SparkFun Barometric Pressure Sensor Breakout – BMP180 This is a breakout board for the Bosch BMP180 high-precision, low-power digital barometer. SparkFun OpenSegment Serial Display – 20mm (Red) OpenSegment makes it easy to add a large 7-segment display to your project.